Chie Sakakibara (Iñupiaq names: Siqiñiq & Kunina) is an Assistant Professor of Geography in the Department of Geography & Planning at Appalachian State University. She is a cultural geographer interested in global indigenous studies, human–environment relations, and human–animal interactions. 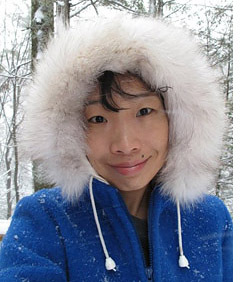 Her current research focuses on global warming and its influence on traditional relationships with the bowhead whale (Balaena mysticetus) in the Alaskan Arctic, particularly among the indigenous Iñupiaq people who call themselves the “People of the Whales.” In addition to her own research, she collaborates with the Center for Ethnomusicology at Columbia University in the City of New York for their community–partnered Iñupiaq music heritage repatriation project in which she works with Dr. Aaron A. Fox in the villages of the North Slope Borough. She also explores climate change and cultural survival among the islanders of the Azores, Autonomous Region of Portugal in the northern Atlantic. You can visit her academic web–page at the Appalachian State University by clicking here.